Doss Logistics is a full-service transportation solution, comprised of Rich Doss, Inc. (LTL—less-than-load), F3 Systems, Inc. (TL—truckload), and Doss Dedicated. This gives Doss Logistics the ability to service all types of flatbed freight, TL, Partial, and LTL, for all your supply chain needs. Doss Logistics is not limited to just industrial flatbed freight, but can also service other types of needs as well; such as dedicated, warehousing and distribution, intermodal, cross-dock, heavy haul and various general freight services, including van freight. At Rich Doss, Inc., our most distinct service is that we are an asset-based carrier that specializes in LTL Flatbed Freight. 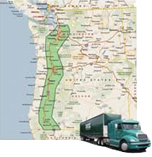 Doss has the only LTL Flatbed Terminal Network in the West Coast, with 10 locations throughout Arizona, California, Nevada, Oregon and Washington. LTL transit times are very similar to all the well-known common carriers and we keep competitive with them by having a 95% on-time record. Rich Doss, Inc. has been in the transportation business for over 35 years. Our background in flatbed truckload transportation has helped us to become a leading flatbed LTL carrier. We have developed and refined our unique industrial freight system to move more than 65,000 shipments annually, while keeping our claim ratio under 1%. In addition to our core business we have F3 Systems, Inc., a full service Truckload Division which includes a Brokerage department for handling out-of-area orders, nationwide shipments, and large projects. Lastly, we have Doss Dedicated, which specializes in logistic consulting and dedicated contracts. Shipping with DOSS Logistics will make your supply chain issues worry-free and allow you to be more competitive and efficient in your market. Since the first of 2009 DOSS has been consolidating LTL loads for the I-5 Corridor out of our Sacramento terminal. Now DOSS has open a full time terminal in the Portland Area. Average time of delivery to the OR and WA area has been 3 days from pickup. We will be starting with 3 trucks out of the location and expect full service to be rolling around mid April. Copyright © 2019 Doss Trucking | All Rights Reserved | Web Development By West County Net, Inc.